The new destinations in the Aulanko Peace area, Aulanko Lakeside and Aulanko Lake Hide-out, are under construction as planned. Both are ready by early May. Aulanko Lakeside complex is crowned by a brand new main villa, which rises right on the shore of Lake Aulangonjärvi. Once the main building is completed, a newly renovated villa, lakeside sauna and accommodation cabin will be added to the new Lakeside complex. 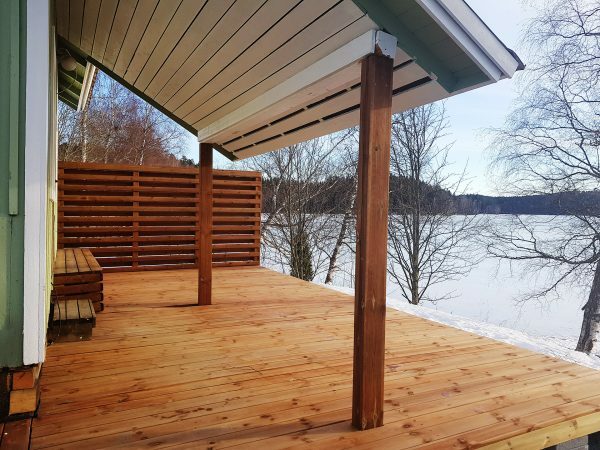 The new Aulanko Lake Hide-out is a small and nifty villa with a suitable accommodation facility in the western corner of the Aulanko Peace Area, in its own Peace and Privacy. In spite of frost and snowstorms, a stunning landscape terrace is already ready. In the spring, the interiors will be finished, after which the first guests of Lake Hide-out will come! Aulanko Peace Area is open to the public on Sunday 10.3.2019 in Aulanko Peace Winter Event. It will take place from 13:00 to 17:00, and will provide an opportunity to explore the area and its villas. Fixed hot tub is soon available in Evo Syväjärvi! The best ice-fishing season is at hand soon, make your reservation now! Stay at our Aulanko destinations and enjoy the Hämeenlinna events!